If you’ve visited a pioneer village or watched movies about settlers in North America during the 1800’s, you may be familiar with the original soap-making process. There were two basic ingredients – lye and animal fat. The lye was extracted from the ashes of wood fires. Simply placing cold ashes in a barrel and pouring water over them produced an alkali solution that drained from the bottom of the barrel. Filtering through cloth would remove any bits of ash and debris. The fat or “lard” obtained from the butchering of animals was rendered by boiling it in large kettles of water. Upon cooling, the melted fat rose to the top where it solidified and was removed for soap-making. Boiling the rendered fat or “tallow” in the lye solution resulted in a soft soap that floated to the surface where it was skimmed off. Many advances have gone into modern soap-making to create much more sophisticated bars of hard soap. Scents and other attractive features can be added to them. Even though the lye process has been replaced by less harsh methods, the result is basically only a more refined and gentle form of the rather rough soap the pioneers made. The key thing in all of this is the fact soap molecules have a “fatty acid” end with a sodium atom attached. In normal washing operations, the sodium drops off and forms a sodium ion. The ionic end of the soap molecule that is left links up with the dirt and oils on our skin and removes them. Most people like their soap to form a rich lather. Depending upon the nature of the water being used, there may be more lather, or soap suds, than with water from other sources. The culprit reducing the formation of suds is calcium. Calcium is found in “hard” water that is typically from wells where there is an abundance of limestone. This calcium carbonate is easily dissolved and calcium ions are formed. Calcium ions have a double positive charge on them and are quite reactive in the overall scheme of things. When soap is added to hard water, the calcium ions see the sodium atoms on the end of each soap molecule. In a somewhat bullish fashion, a single calcium ion knocks the sodium off the ends of two soap molecules. Each sodium ion that is formed only has a single charge, so the doubly charged calcium ion then grabs onto the ends of these two soap molecules to fill the imbalance left by the departure of the sodium ions. This joins the tails of two soap molecules and makes them insoluble in the water. As a result, a deposit is formed which we call soap scum. In the accompanying photograph, we see two glasses of water with differing amounts of suds on their surface. The glass on the left contains distilled water with no minerals present – just like rainwater. Five drops of liquid hand soap were added to the distilled water and agitated using a hand mixer. There is a good head of suds to show for this effort. 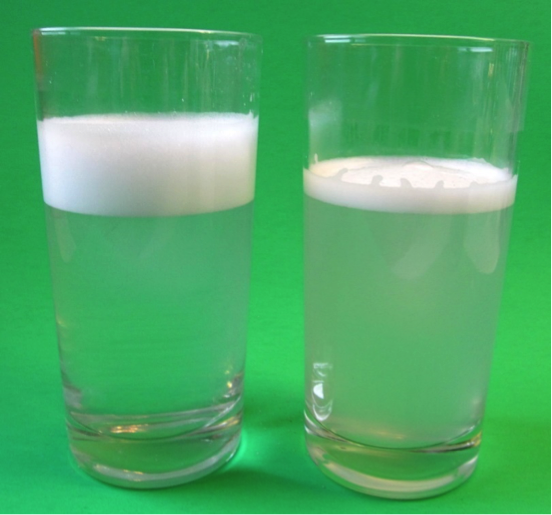 Several teaspoons of calcium chloride powder were dissolved in the water in the glass on the right. After adding five drops of liquid hand soap to the hardened water, there was a marked reduction in the suds formed with vigorous stirring. What happened here was that each calcium ion grabbed the ends of two soap molecules, creating a cloudy solution with only a small head of suds being formed when it was agitated. To reduce soap scum formation and promote the sudsing of soap in your home, water softeners can be used to remove calcium ions from the water that would otherwise bond the soap molecules together. As a result, there is a significant reduction in the formation of soap scum. In a future article, we will examine how the water softening process works. Meanwhile, understanding the way in which soap scum is formed may help you contend with the problem if you are currently experiencing it. The glass on the left contains distilled water while the glass on the right contains water with added calcium ions. Note the difference in soap suds formation.